I admit I was a bit apprehensive of this flight. 13 to 14 hours on a plane seemed challenging and the fact it was United. My international travel experience on United as a flight across the pond to London in 2003. I remember that flight with broken seats, unfriendly crew and lousy food. Now why would I choose United for the longest plane journey of my life ? My ticket price using Jet Airways a United partner to fly from Washington DC to India was the lowest. No additional charge for stopover at Dubai. The flight was full and took off from Gate C3 at Dulles airport. 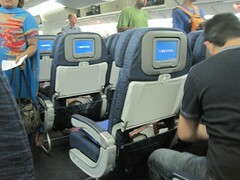 Boarding was good and we had some nice seats in United's Economy Plus. All seats have a entertainment console. There are two meals served dinner an hour after take off and breakfast about an hour and a half before landing in Dubai. In between you can walk to the Galley and have your choice of vegetable sandwiches, kit kat bars, potato chips or pretzels. I was disappointed that even on this trans Atlantic flight you pay for beer and wine. All other airlines offer free drinks even in economy class. You get a choice of 4 movies and a few TV shows in the complimentary section of the entertainment and the premium choice is more extensive even though in my opinion not by much. Premium costs $10 for the flight. I slept a lot as you should and wathced the maps more than the entertainment. The mix of passengers - seemed to me- that they included parents of Americans of Indian origin returning to India, folks like me going to visit parents back home, US army personnel, contractors. 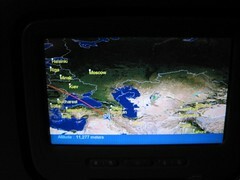 The announcements on the flight are in English, Hindi and Arabic. There were 4 crew members for the economy class. I think they could have used some help. They were very friendly and efficient and had one of the Business class crew come in to help. I have a feeling many other international carriers have more than 4 in the economy. Downside of less staff is that it takes longer for food service to reach the rear passengers. I am looking forward to my return journey as it will be the fastest way back home from Hyderabad to Washington DC. Have you gone on long flights ? 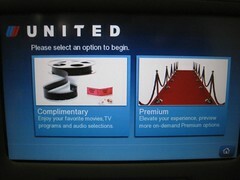 What is your experience on United ?